Berlin is the most fabulous city on the planet. Repeat after me: Berlin is the Most Fabulous City on the Planet. Good children. Now, take off your shoes, find a comfy chair, and let me tell you about my weekend of Berlin magic. It was a whirlwind, a rush of images and impressions, of firsts and of shoulda-done-this-a-long-time-agoes. I visited Berlin for the first time on my first-ever weekend alone with my husband since our first child was born, so be warned, any superlatives you may encounter in this post are partially due to the sensation of extreme liberation. This was not just Charlotte does Berlin, but Charlotte does Berlin ON STEROIDS. Berlin is a city of staggering proportions. Even the Hauptbahnhof where our train arrived is a sparkling monument of glass. Berlin has giant boulevards, enormous buildings and a huge spirit. Berlin is relaxed. Berlin is a laugh. Berlin is spontaneous. Berlin is old and new, East and West, prewar and postwar. It is tragic. It is humbling. It is humane. It is the best fun I’ve had in years. We arrived at our beautiful Friedrichstrasse hotel at 11pm, dropped our bags and went out for dinner. We strolled down the Oranienburgerstrasse, which is a stunning mixture of hip hotels, restaurant, bars, open lots full of weeds and graffiti-ied walls, imbiss stands, working girls in thigh-high boots and crowds of people. This street falls in the district of Berlin Mitte, which my Lonely Planet guide describes as “the glamorous heart of Berlin, a high-octane cocktail of culture, commerce and history”. It’s also former East Berlin, so the tang of freedom and laissez-faire was particularly envigorating. We had a stroll, a curry and then retired. On Saturday we – ahem – slept late (this is a family blog after all), enjoyed a leisurely breakfast on the banks of the Spree river. 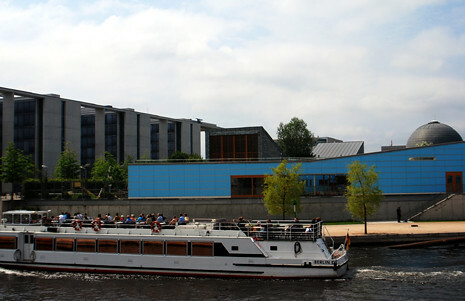 Then we caught a boat tour, and admired the Reichstag with its new glass cupola, the new parliamentary buildings, many monumental museums, the Berlin Dom, the bizarre skeleton of the DDR governmental building (which is being pulled down) and lots and lots of happy Berlin people sunbathing on the banks of the river. Then I achieved another first, and only out of journalistic curiousity, mind. Back at the hotel, we stripped (none of that now), put on our chunky orange matching dressing-gowns and proceeded to the day-spa where your correspondent bravely plunked herself down on the hot benches of her first-ever co-ed sauna. Correction, first sauna ever. I was so busy trying not to faint I forgot that I was nekkid that my mascara might be running and that any moment someone might come in and notice that I was looking like a sweaty raccoon. We showered, had some kind of watery Dampfbad, showered again, lay on chaise longues in our orange gowns and viewed the scene over the Spree through the one-way glass. It was SO decadent and SO Berlin. Later, we walked, saw sights, got caught in a thunderstorm, saw more sights, window-shopped and went out for dinner at a Spanish restaurant under the railway bridge at the Haekeschemarkt. 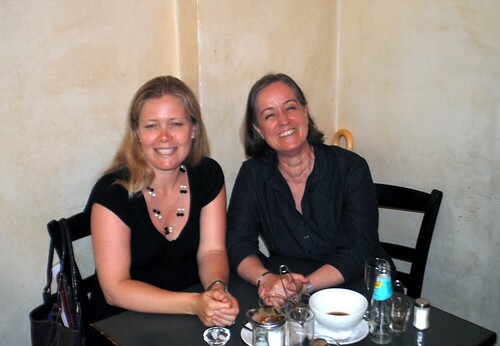 The next day, we moved from our hotel to our friend Martin’s apartment in Charlottenburg. When I grow up, I want to live in Charlottenburg. It’s a fabulous district, with leafy avenues, a famous schloss, museums, lots of children and playgrounds. People play boules there. Martin took us for breakfast in the Tiergarten (yummy food and celebrity-spotting) and then on a spontaneous tour of Potsdamerplatz and the Holocaust monument and museum. 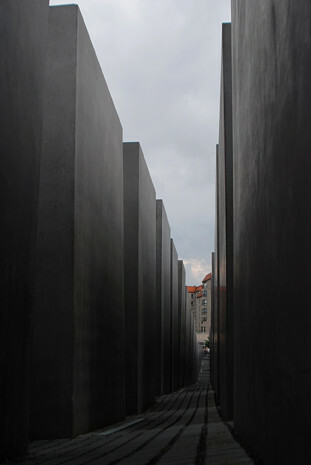 This was the humbling part of my stay in Berlin. The monument moved me with its chilly blocks of concrete set at various heights. It felt a little like a cemetery. I wanted to be still and listen for distant voices. After bidding farewell to Lia with a pang, I went to meet my lovely husband and the ruinously party-happy Martin in the lively Kreuzberg district, which was holding its annual Karneval der Kulturen. This weekend-long street party celebrates the immigrant communities of Berlin, of which there are about 150. Each community has stands of food and crafts, there are street buskers, shows in churches, much drinking in beer-tents (Berlin may be deeply cool, but it is still Germany) and the highlight: a parade of trucks blasting music specific to that community. You choose the truck whose music you like and dance behind it. Readers, I danced on the streets of Berlin for four hours, fuelled by cocktails and the most relaxed, non-threatening party atmosphere I have ever known. I moshed in the mosh-pit, shuffled happily behind the Jamaican truck and raved to techno. I rediscovered my inner party animal. It was fabulous. Later, with Martin and our New Best Friends Tina and Gunther (whom we met in the beer tent), we went bar-hopping till dawn. Berlin is SO dangerous. It can turn a staid mother-of-three from the Burg into all-night party binger. Liberation felt very very good. The next morning, we felt very very bad. Martin, the best tour guide two provincial Burgers could ever hope for, ignored his own hangover to drive us to Potsdam. There we strolled through parks and admired a variety of beautiful castles, lakes and villas before having one last langorous (non-alcoholic) Berlin drink and getting on the train to come home. Berlin was magic – the perfect antidote to life in the Burg. Categories: Berlin, Holidays, Life in the Burg, Living in Germany, NaBloPoMo, Travel | Permalink. Berlin is the most fabulous city on the planet (now, I just have to get there). Meanwhile, when you and Mr. Charlotte finally come to Pennsylvania (once we’ve moved and settled in) and (after admiring the fabulous house you knew we should move into, of course) dump the kids on us for a long weekend, while you disappear, I expect you to be saying “Philadelphia (or whichever city you choose: we’ll be within easy distance of NYC; Washington, D.C.; Baltimore, MD; and Wilmington, DE; as well as Philly) is the most fabulous city on the planet.” Of course, I don’t promise that you won’t return to children who have been spoiled rotten and who want you to go away again. Thanks, Emily, I will accept your kind and generous offer! Without small children in tow, it is far easier to appreciate a city’s fabulosity. So glad you had the first of many kid free trips! Told you , you would enjoy it! 🙂 Berlin sounds amazing! Wow Charlotte, you really let loose! I’ve been bragging to my friends about how I can still burn the candle at both ends for six days straight (after Chicago), but it looks like you packed six days into a weekend! Great to hear how much fun you and your hubby had. Berlin goes on my ‘must visit’ list. Also, how wonderful for you and Lia to meet! I hadn’t realised that you two were cyber and not face-to-face buddies (until last weekend). It is a beautiful photo of you both. Sounds amazing! I’d forgotten that it was possible to do so many things in one day. I must try going off without the kids soon, it sounds like a magical formula, though I don’t think I’ve had that much stamina since I was a student. I’d be more likely to fritter away the time sleeping. Hope it’s the first of many for you. I believe this is the first picture I’ve seen of you and you look EXACTLY like I imagined you! Lovely photo. And lovely also is your review above of TPBW. I agreed on all points. What a lovely weekend you had! We’ve been to Berlin twice, each time for a couple of days and still didn’t manage to absorb it all. Amazing city. I’m exhausted just reading about your wonderful weekend. Berlin has been on my must visit (someday…) list for a while and now it’s moved right to the top. Great to hear you had such a great time on your parents weekend off! I love the image of you moshing! Thank you. Did you get a chance to fit in KaDeWe during your weekend of child-free debauchery? You look exactly how I imagined you too! Hey, I checked your blog yesterday and there were no new posts, then today there are three! Wow! My computer’s been hiding them from me! Cheeky computer! I’m glad you had a good weekend. I “HEART” Berlin too! I lived there from 2003-2005. Although I live in London now – a great city in its own right – it can’t hold a candle to Berlin. My friends here in London get tired of me talking about the city, but now that several have made the trek with me back to Berlin to visit they get it. My favorite things about Berlin are being able to ride bikes everywhere and brunch on Sundays! I had to laugh about the “sleeping late”…we just spent 10 days at my mother’s house (mit Kindern) and I tell you, there was no sleeping late, with quotes or without! What a weekend! I’m not a fan of drinking and dancing, but I would dearly love to see Berlin. Long ago and far away, my relatives lived there and I would like to track down where exactly they lived. Probably impossible, but it would be fun trying. And Charlottenburg does sound ideal. Lovely photo of you – it’s so fascinating to put faces to voices! And yes, I’d heard that Berlin was a wonderful place. So glad to hear how much you enjoyed it. Huiii – thank you very much for this declaration of love to my City. I very much look forward to meeting you and Thomas soon. Please give my regards to Thomas. I believe in this Summer we have every Weekend a great Party or Event. On this Weekend for example we celebrate the ‘Havelfest’ – I think that would a great pleasure for you. I like the first picture. You know what the blue building is? It’s the Bundestag’s kindergarten.